Before you swing yourself up on the saddle there is quite a bit to prepare: grooming, hoof cleaning, saddling and, of course, getting to know your new companion. He is just as curious as you are! Now you will set off... are you a little nervous? Don't worry, you're sure to easily manage the hilly and varied terrain of the Toggenburg with your good natured horse or pony and will love the view from being on horseback. It's sure to bring back memories of Black Beauty...! The horses are mainly Freiberger − these are good natured work horses which have many years experience of being ridden in such events. Even if the horses aren't always commanded correctly, they will not take it to heart and will usually still take you in the right direction. 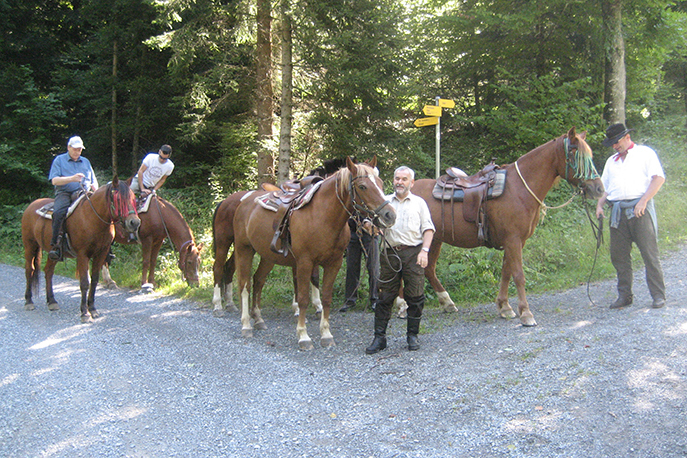 A riding instructor will accompany you throughout and beginner's horses will be guided by hand. You will practice various step and trotting styles and will acquire the riding basics. More advanced riders will be allowed to gallop. 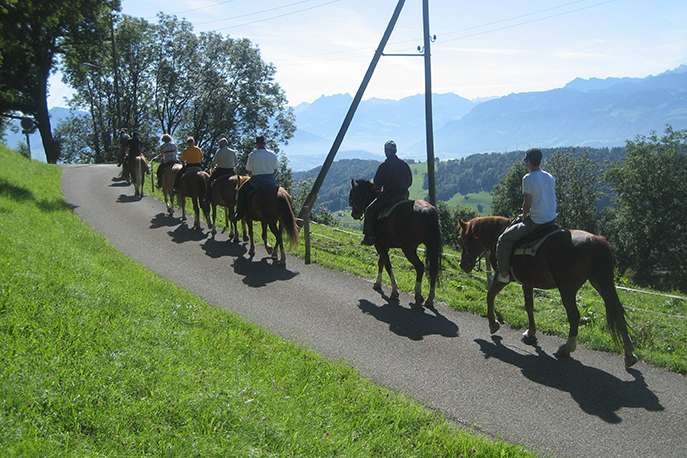 In larger groups, you will take it in turns to ride and lead the horse &mnus; this also encourages mutual trust. Handling the animals requires respect and patience but those who bring this with them will be rewarded with an unforgettable experience. Horses / ponies, further materials, expert guidance and instruction. Stop off for a break during your ride and enjoy a down to earth meal e.g. campfire barbecue, outdoors in nature, or a barbecue get-together at the farmhouse. The horse ride may also be combined with other event elements e.g. Archery or Team games.